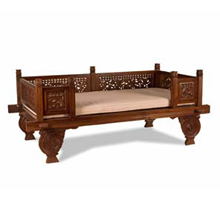 Nothing speaks exotic and cozy more fluently than an Asian daybed. Over populate your daybed with stylish pillows, or keep it clean and simple, whatever decor direction you choose we sure you'll love our Balinese daybed collection. Click on the images above for details, pricing and more views. Did you know that despite the hard work of eco organizations like the WWF (World Wildlife Foundation), Indonesia's leading environmental conservation group, over harvesting of Asia's forest is still a common problem? Its important that we all aid the hard work of these agencies by avoiding companies that produce and retail furniture made from black market wood. At Tansu we specialize in eco friendly Asian day beds that are made of reclaimed or sustainable wood. Looking for an outdoor daybed? We have a complete collection of outdoor wicker daybeds made from recycled synthetic rattan. Outdoor day beds add a tropical vibe that commands relaxation. Perfect for residential and commercial poolside and gardens.